Description BIBR 1532 is a selective inhibitor of telomerase with IC50 value of 93 nM for human telomerase. For the direct telomerase assay with the endogenous telomerase, 10 μL of telomerase-enriched extract was mixed with different concentrations of BIBR 1532 in a final volume of 20 μL. After 15-minute preincubation on ice, 20 μL of the reaction mixture was added, and the reaction was initiated by transferring the tubes to 37 °C. The final concentrations in the reaction mixture were 25 mM Tris-Cl (pH 8.3), 1 mM MgCl2, 1 mM EGTA, 1 mM dATP, 1 mM dTTP, 6.3 μM cold dGTP, 15 μCi [α-32P]dGTP (3000 Ci/mmol), 1.25 mM spermidine, 10 units of RNasin, 5 mM 2-mercaptoethanol, and 2.5 μM TS-primer (5'-AATCCGTCGAGCAGAGTT). 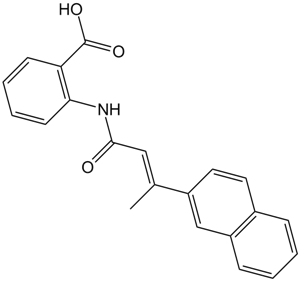 The solubility of this compound in DMSO is > 15.65 mg/mL. General tips for obtaining a higher concentration: Please warm the tube at 37 °C for 10 minutes and/or shake it in the ultrasonic bath for a while. Stock solution can be stored below - 20 °C for several months. In Nalm-6 cells, BIBR 1532 at the concentrations of 30, 60 and 90 μM inhibited DNA synthesis rates by 10, 17 and 28%, respectively. 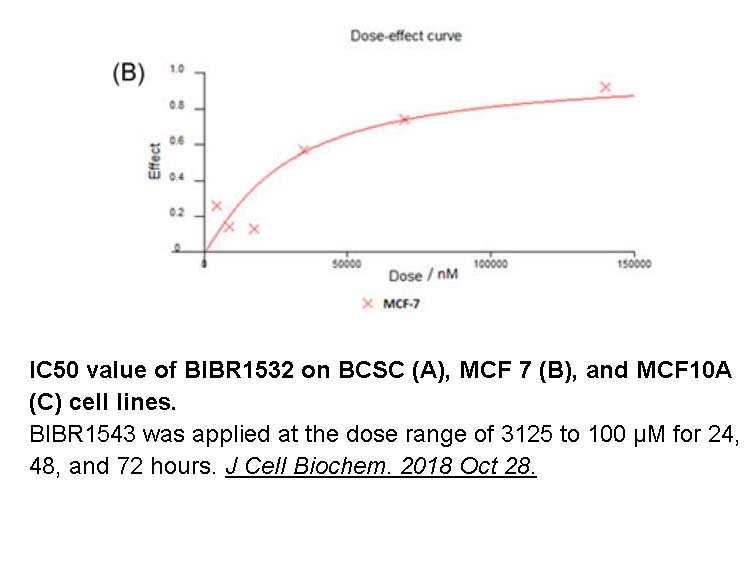 MTT assay analysis showed that BIBR 1532 concentration-dependently reduced the metabolic activity of Nalm-6 cells (15, 30 and 44% at the concentrations of 30, 60 and 90 μ M, respectively). At the doses of 10 and 30 μM, BIBR 1532 partially inhibited telomerase activity while at the higher doses, i.e. 60 and 90 μM, BIBR 1532 resulted in marked telomerase inhibition.
. Pascolo E, Wenz C, Lingner J, Hauel N, Priepke H, Kauffmann I, Garin-Chesa P, Rettig WJ, Damm K, Schnapp A. Mechanism of human telomerase inhibition by BIBR1532, a synthetic, non-nucleosidic drug candidate. J Biol Chem. 2002 May 3;277(18):15566-72.
. Bashash D1, Ghaffari SH, Mirzaee R, Alimoghaddam K, Ghavamzadeh A. Telomerase inhibition by non-nucleosidic compound BIBR1532 causes rapid cell death in pre-B acute lymphoblastic leukemia cells. Leuk Lymphoma. 2013 Mar;54:561-8. BIBR 1532 is a novel, specific telomerase inhibitor with IC50 of 93 nM .
. Damm, K.; Hemmann, U.; Garin-Chesa, P.; Hauel, N.; Kauffman, I.; Priepke, H.; Niestroj, C.; Daiber, C.; Enenkel, B.; Guilliard, B.; Lauritsch, I.; Muller, E.; Pascolo, E.; Sauter, G.; Pantic, M.; Martens, U. M.; Wenz, C.; Linger, J.; Kraut, N.; Rettig, W. J.;Schnapp, A. A highly selective telomerase inhibitor limiting human cancer cell proliferation. EMBO J. 2001, 20, 6958−6968.
. Bashash D1, Ghaffari SH, Mirzaee R, Alimoghaddam K, Ghavamzadeh A. Telomerase inhibition by non-nucleosidic compound BIBR1532 causes rapid cell death in pre-B acute lymphoblastic leukemia cells. Leuk Lymphoma. 2013 Mar;54:561-8. doi: 10.3109/10428194.2012.704034. Epub 2012 Sep 28.
. Bashash D1, Ghaffari SH, Zaker F, Kazerani M, Hezave K, Hassani S, Rostami M, Alimoghaddam K, Ghavamzadeh A. Anticancer Agents Med Chem. 2013 Sep;13(7):1115-25. 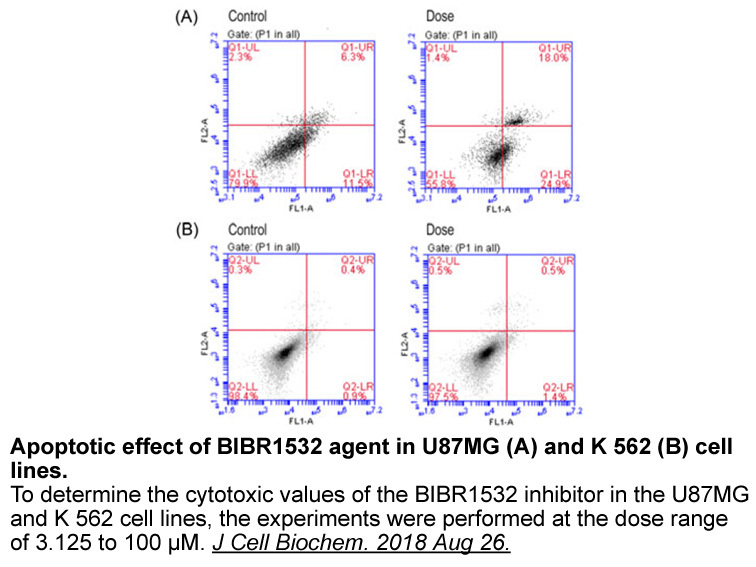 BIBR 1532 increases arsenic trioxide-mediated apoptosis in acute promyelocytic leukemia cells: therapeutic potential for APL.